Because of the history between Walt Disney World and myself I have been fortunate to have many “firsts” there. I got my first bike and learned to ride in the Fort Wilderness campground. I pulled my first tooth outside of Walt Disney’s Carousel of Progress in Magic Kingdom. I experienced my first “first” on Main Street USA at the Harmony Barber Shop. That’s right, that is where I got my first haircut. 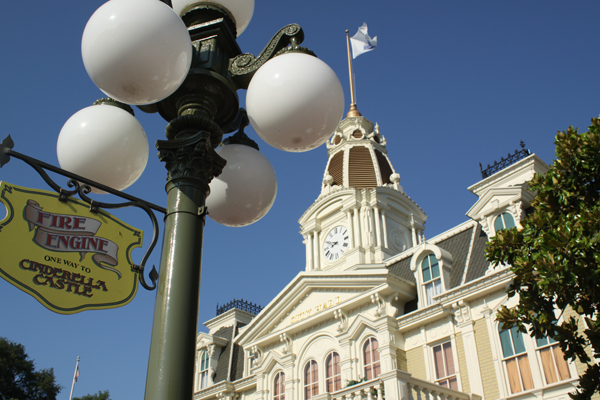 Town Square is an attraction in and of itself! Don’t rush through Main Street! There’s so much to see! 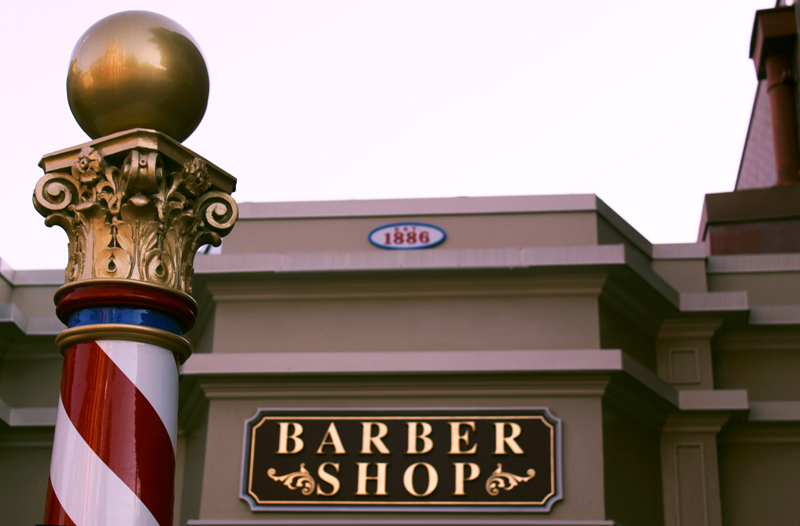 Much like the rest of Town Square and Main Street USA, when you set foot inside the Harmony Barber shop you feel as though you have been transported to a turn of the century small town because of the ornate and often authentic decor. Everything from the wallpaper to the barber chairs give the shop that nostalgic feel. It is definitely worth at least poking your head in even if you or a little one are not going for a trim. If you time it just right you might even be visited by the barber shop quartet, The Dapper Dans. I do believe they would make their appearance sometime around midday, so that would be the only reason (and a very good reason at that) to visit the shop any time other than the morning. He’s cute like his uncle was too! During our trip in May we may have (and I hope) started a family tradition. 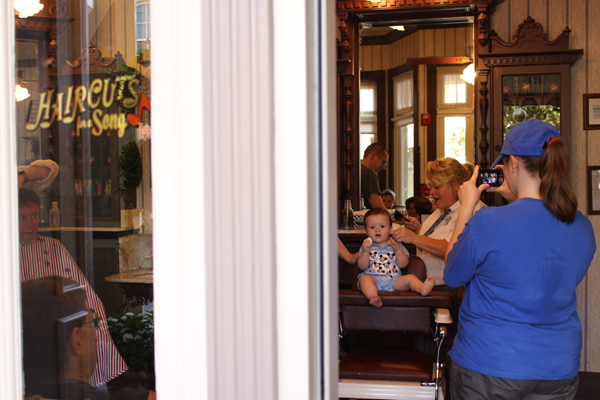 Like his uncle, my little nephew, Jared, got his first haircut at Walt Disney World! After his haircut he received complimentary mickey ears with “My First Haircut” embroidered on the back and a certificate documenting his first haircut. I kind of felt slighted by this because I do not believe (and my grandma can attest to it) that I received any mickey ears or certificate! 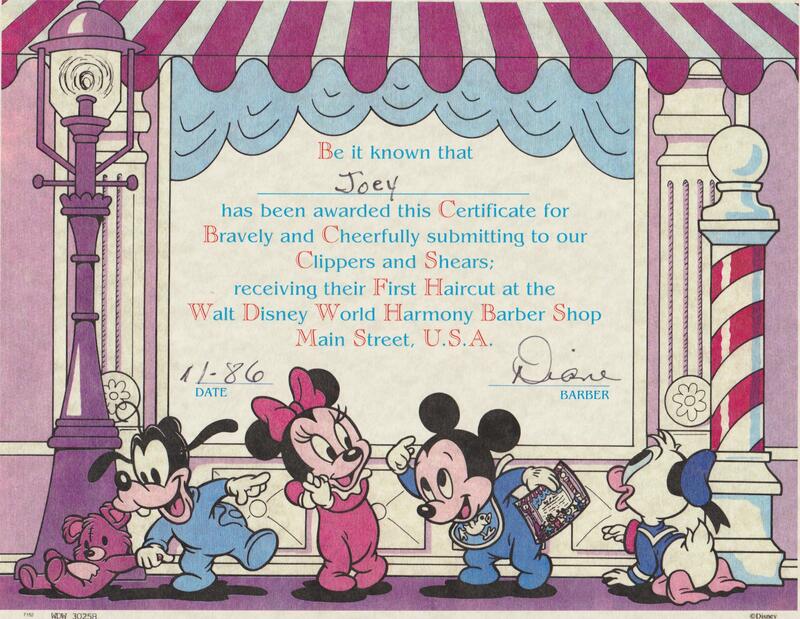 Not to my surprise and in classic Disney fashion the Barber, Diane, presented me with my very own certificate as well. I did not get mickey ears because usually people get their first haircut before their heads are as big as mine so they didn’t have any in my size. I was very appreciative for my certificate. It will be a good way to document the family tradition! 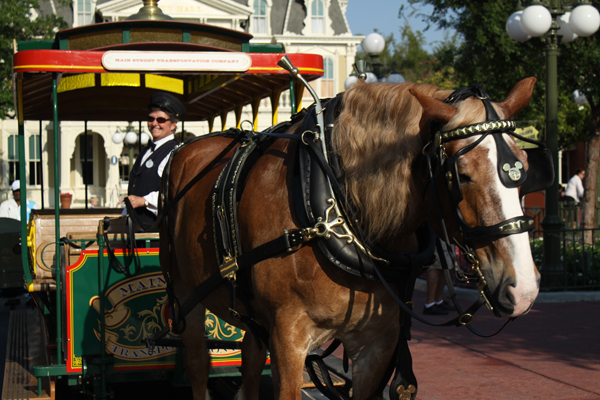 This entry was posted in Hidden Treasure, Magic Kingdom and tagged travel, vacation, Walt Disney World. Bookmark the permalink. I’m hoping Noelle might be ready for a trim by the time we go again, but being a girl, I’m afraid she’ll need to be a little older. We’ll see. Or maybe we’ll have to start a Bippity-Boppity Boutique tradition for the girls. yeah, Bippity-Boppity Boutique and Pirates League/Jedi Training Academy a must for my niece and nephew!